The Bears are now 7-1 for the season. Lovie Smith demanded a fast start from his Chicago Bears after a sluggish performance a week ago. Charles Tillman forced four fumbles. Brian Urlacher scored on a 46-yard interception return. Plus, Chicago turned a blocked punt into a touchdown. Jay Cutler threw three TD passes to Brandon Marshall just for good measure and the Bears put up their highest point total since 1980, routing the Tennessee Titans 51-20 on Sunday for their sixth straight win. "We didn't want to have a repeat of last week against Carolina," Tillman said. "This week our whole motto was, 'Let's start fast.' To create a turnover on the first play of the game was the mindset going into the game." Tillman did just that, stripping Titans receiver Kenny Britt on Tennessee's first offensive play and proving how exceptionally dangerous these Bears are even when they don't start with the ball. The Bears (7-1) scored a franchise-record 28 points in the first quarter. They took control by creating three turnovers in the first 13 minutes, resulting in 14 points. Urged on by its coach, Chicago wound up with takeaways, beginning with the first Tennessee snap. "It has to be upsetting when you know our reputation coming in," Smith said. "It's not like it's the first one we've done. Every team we've played has the mindset that this team will strip the ball. That's who we are." Urlacher became the latest Bears defender to score on an interception return. They have done it a club record seven times — no other NFL team had returned six for TDs through the first seven games of any season. The Bears had already topped the 50-point mark with 10 minutes still left. They posted their highest-scoring game since matching a team record in a 61-7 win over Green Bay on Dec. 7, 1980. Chicago fans took over LP Field, booing any video highlights featuring the rival Packers and frequently chanting "Let's go, Bears." "It was weird," Cutler said of all the Bears fans. "I had to hush the crowd down in the red zone, and they got quiet really quick. We have the best fans in the world." The Titans (3-6) lost their second straight, giving up the most points since a 59-0 loss to New England on Oct. 18, 2009. Coach Mike Munchak said they had warned the Titans all week how crucial protecting the ball would be against the Bears. "We made it easy on the Bears to beat us," Munchak said. "But they took advantage of all the opportunities we gave them." Tennessee's lone highlight when Chris Johnson scored on an 80-yard run in the fourth quarter. Johnson finished with 141 yards on 16 carries against the NFL's best rushing defense, with a big chunk coming when he broke out and went up the right sideline with 10:09 left in the fourth quarter. Tillman, the NFC defensive player for October, started the Bears' first-quarter spree with the strip of Britt the Bears' 24th turnover this season. The cornerback also forced two fumbles by Johnson and later stripped tight end Jared Cook. "He just finds a way of getting his hands on the ball, knocking the ball out and always being around the ball," Johnson said. Cutler tossed TDs of 13, 39 and 5 yards to Marshall and finished with 229 yards passing. Cutler, who starred in Nashville in college at Vanderbilt, spent the final 10 minutes watching Jason Campbell mop up. 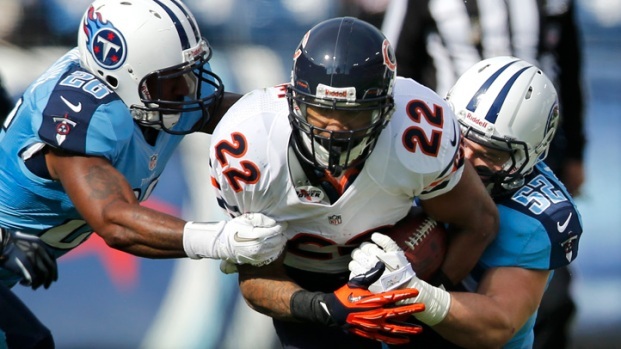 Matt Forte ran for a TD and finished with 103 yards. The Bears got on the board first with special teams. Sherrick McManis ran untouched around the right edge and blocked Brett Kern's punt, and Corey Wootton grabbed the ball and stumbled 5 yards into the end zone for a touchdown with 6:44 left in the first quarter. 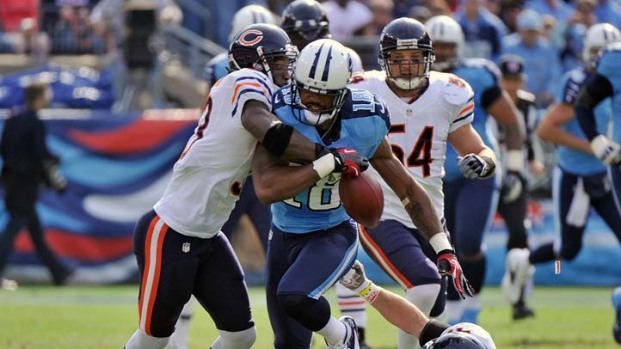 The Titans came back with a safety when Bears left tackle J'Marcus Webb grabbed at defensive end Kamerion Wimbley's face in the end zone. Otherwise, the Bears dominated. Urlacher picked off Matt Hasselbeck and stepped over the Titans quarterback on his way to the end zone two plays after Forte's TD run. Tillman forced another fumble on Tennessee's next offensive play, and Chris Conte recovered. "We have been waiting for Brian to really step up like that," Smith said. "Outstanding job by him. Touchdown, caused fumble, recovered fumble. The defense was a frenzy out there, really taking the ball away." Cutler capped the scoring for the first quarter with his first TD pass to Marshall and a 28-2 lead with 93 seconds still left. Even in the blowout, the Bears showed their offense still needs some work. They outgained the Titans 358-333 despite holding the ball for 37 minutes against a Tennessee defense that came in ranked 30th in yards allowed. The Bears also settled for three field goals by Robbie Gould, the longest 39 yards. The Titans sacked Cutler three times and force one fumble. That set up a 39-yard field goal by Rob Bironas to pull within 31-5 after three failed attempts throwing into the end zone — two nearly picked off by the Bears.